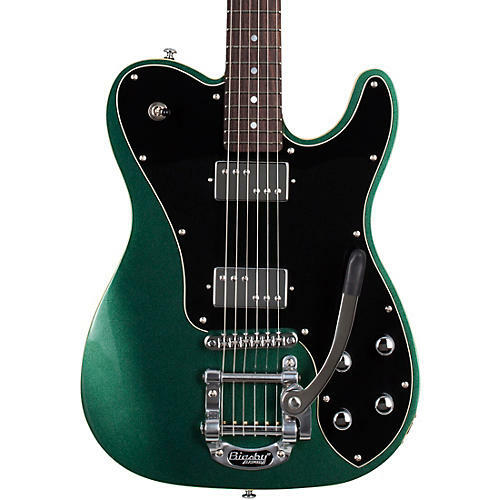 Adding a modern feel to a Schecter classic comes the PT Fastback IIB. 22 Extra Jumbo frets with a 25.5” scale length invites you to dig into some serious rhythm work or soar with some beautiful leads. The thin C neck profile provides comfort and ease of use. Schecter Diamond SuperRock Custom Alnico pickups, with coil split options, gives you an array of tonal possibilities. The rosewood fretboard and alder body provide warmth and sustain. Armed with a Bigsby Flat Top B50 with Roller TOM Bridge, that vintage tremolo feel is at your fingertips. Block inlays and crème binding guarantees provides a sleek look guaranteed to turn heads.